Which meringue shall I whip up today? The common meringue, the sophisticated Swiss meringue or the Italian meringue? The ingredients for all three standard meringues are identical, apart from some added water for the Italian meringue. One large egg is equivalent to about 2 oz, so 8 is equal to about 1 lb. Meringues are normally made with a range of 1:1 sugar egg ratio to 2:1 sugar ratio. The sugar should be caster (fine) sugar. If it is granulated, whiz it in the liquidiser for 30 seconds before using; otherwise, your meringue will be grainy. A common meringue is the least stable of all of the meringues and involves beating the egg whites to soft peak and then starting to add the sugar in increments. 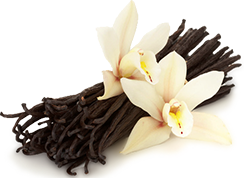 Whip until firm. French meringues are commonly used for folding into batters such as soufflés, lady fingers, etc. 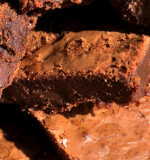 They are also piped and baked at a very low temperature for a long time (the forgotten cookie!) or piped into dessert shells or cake layers. The Swiss meringue involves adding the sugar and the whites in a bowl and warming the mixture over a pan of simmering water, or a bain marie. 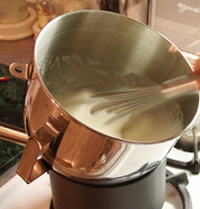 Once the sugar has dissolved and the egg whites are warmed, whip on a medium speed to a firm peak. Swiss meringues can be baked until crisp on a low temperature, or as cake layers or topping pies. The Italian meringue is the most stable of the meringues and involves heating up a sugar syrup containing 75% of the sugar, and then whipping it slowly into the egg whites with the remaining 25% of sugar to a firm peak. The Italian meringues are more commonly used to lighten mousses or to frost cakes and to add to buttercream. 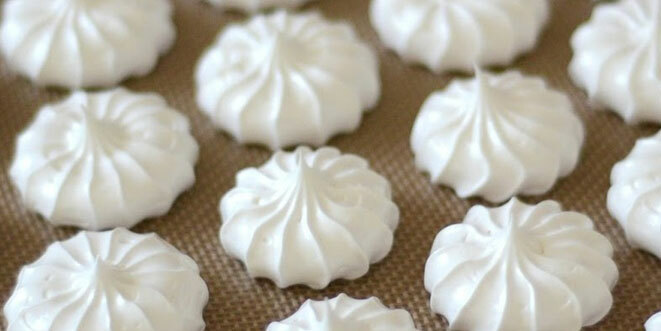 Humid weather is not a meringue’s friend, as they will absorb the water in the air and get soft and sticky. Once cooked, place the meringues into an airtight container. If your meringues have cracks on them, you have probably cooked them at too high a temperature. Yellowing meringues are also a sign of too high a cooking temperature.